France attack: Guns reportedly brought into country from elsewhere. 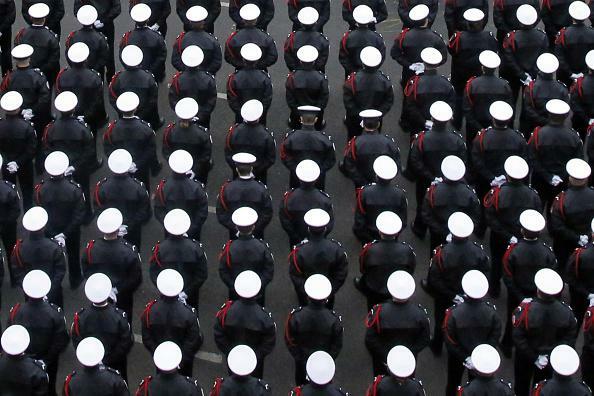 Police in Paris at a ceremony honoring the three officers killed in terror attacks last week. French police say as many as six members of the terrorist cell that carried out the Paris attacks may still be at large, including a man seen driving a car registered to the widow of one of the gunmen. A Frenchman arrested in Bulgaria on January 1 trying to cross into Turkey had links to one of the two brothers who carried out the Islamist attacks in Paris last week, prosecutors said Tuesday. Fritz-Joly Joachin, 29, a French citizen of Haitian origin and a Muslim convert, “was in contact several times with one of the two brothers – Cherif Kouachi,” prosecutor Darina Slavova told AFP. Joachin, who faces extradition to France, was originally detained on kidnapping charges; his wife said he planned to take their 3-year-old son to Syria to live in a violent jihadist community. He denies this allegation and says he is not responsible for the Kouachis’ actions.